In the Chicago Tribune’s Freedom Center facility, located in Chicago, IL, the company prints, inserts and distributes over 40 different titles. Its fleet includes SC Series and C-5 Series sit-down counterbalance forklifts and PE Series pallet trucks. 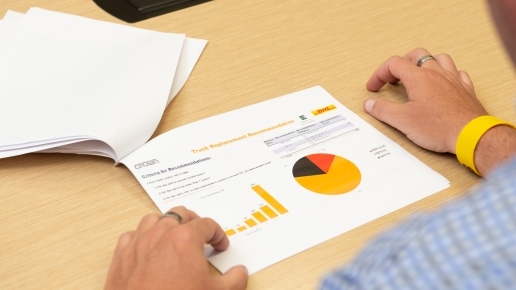 Management was looking for a better way to capture vital information regarding lift truck utilization and impacts and turned to Crown Equipment, one of the world’s largest material handling companies, for a fleet management solution. The Chicago Tribune is using Crown’s InfoLink Operator and Fleet Management System to consistently document pre-shift inspections, generate instant impact alarms and capture lift truck usage data. After incorporating InfoLink on their wide variety of Crown forklifts and pallet trucks, they have experienced a 30 percent reduction in impacts, improving safety throughout the operation. “We absolutely have more control with InfoLink because we know where impacts are happening, we can see usage data, not only with the jeep (lift truck) itself, the equipment itself, but also the operator,” reasoned John Healy, receiving team leader. To further capitalize on the performance of their lift trucks and fleet management system, the Chicago Tribune is also utilizing a Crown service contract, which has helped increase uptime for the company. “Any small issues we’ve had with our equipment have been taken care of very quickly with the Crown tech on site and they’ve fixed everything we’ve needed,” stated Healy. 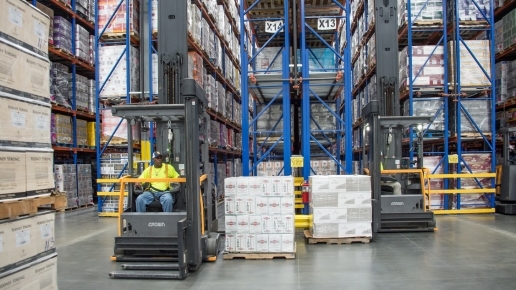 Visit the customer results page on crown.com to learn how the Chicago Tribune relies on Crown’s dependable lift trucks and service to maximize uptime while utilizing the InfoLink system to help them improve safety and make important business decisions.